From cup final and derby day goals to the dramatic title-winning strike that spawned a thousand vowels, Sergio Aguero has always been Manchester City’s man for the big occasion. The Argentine international is arguably the most prolific big-game marksman in Premier League history, and Aguero’s record in fixtures of magnitude and significance is so abnormally consistent that you’d be tempted to check if he had rabbit’s feet inside his boots. His phenomenal big-match numbers are down to his unique ability rather than any element of luck however, and Aguero has a unique set of game-turning attributes that few can match. In his youth, Aguero’s grandparents gifted him the nickname “Kun” due to his resemblance to a character from the Japanese cartoon Kum-Kum – a moniker that now feels suitably ironic with Aguero regularly leaving opposing defenders looking completely inanimate. Sergio Aguero’s Premier League debut double against Swansea City on the 15th of August 2011 was a foreshadowing moment for the then 23-year old, who has since gone on to become the club’s record goal-scorer. But it was Aguero’s goal at White Hart Lane a fortnight later in City’s 5-1 mauling of Spurs that kickstarted his phenomenal long-running record against the Premier League’s biggest and best. In total, Sergio Aguero has plundered 40 goals in his 62 Premier League appearances against Manchester United, Liverpool, Arsenal, Chelsea and Tottenham Hotspur collectively. It’s a strike-rate that almost defies belief. Tottenham Hotspur have been on the receiving end of Aguero’s explosive finishing 10 times since 2011, though remarkably enough, the Argentine hasn’t found the net against Spurs since May 2015. Aguero bagged his 10 goals against Spurs inside his first 8 appearances against them, including a single 4-goal haul against them in October 2014. In the always heated Manchester Derby, Aguero has produced the goal-scoring goods 8 times. Aguero scored his 8th derby goal this season in City’s 3-1 win over United in November, a strike that put him level with Bobby Charlton as the joint 4th top scorer in Manchester Derby history. Wayne Rooney tops the Manchester Derby historical charts with 11 goals, though Aguero still has ample time to catch up and overtake the former England international. Aguero has a chance to cut the 4-goal deficit when United meet City at Old Trafford in mid-March..
Aguero’s sensational hattrick against Arsenal earlier this month brought his Premier League career total against the Gunners to 8, while his crucial deadlock breaker against Liverpool in early January was his 7th goal against the Merseysiders – all of which were scored at The Etihad. Chelsea have also been singed by Aguero’s red-hot right foot. The Blues have seen the former Atletico Madrid star score 7 times against them in the Premier League. Aguero scored twice against Chelsea in this season’s Charity Shield too, but he hasn’t registered in the league against them since April 2017. The 30-year old will fancy his chances of bringing that record up to speed on Sunday however. It might surprise you to learn that the 2 seasons in which Sergio Aguero made his least number of Premier League appearances for Manchester City (23 apps in 13/14, and 25 in 17/18), were the 2 seasons that the Citizens won the title since their Abu Dhabi takeover in 2008. In truth, the relatively low appearance figures Aguero posted during City’s title-winning seasons were coincidental rather than a hint of a pattern or correlation. Throughout his City career, Aguero has always been central to the team’s pursuit of silverware, as evidenced in his fantastic performances and the goal scoring prowess he has displayed this season. Aguero is just a couple of goals shy of the Premier League’s current leading goalscorer Mohamed Salah. Arsenal’s Pierre-Emerick Aubameyang also stands between Aguero and top spot, though the Argentine’s goals per game record suggests that he’s still in prime position to make a run for the Golden Boot – an award he has won just once, back in 2014/15. Aguero has scored 0.66 goals on average per Premier League appearance this season, putting him ahead of his rivals in that metric. All 4 of his chart-topping antagonists have been on penalty duty for their respective clubs at various points in the season too, though none of Aguero’s 14 goals were hit from the spot. In fact, if you strip out the penalties scored by Salah, Aubameyang and Kane in 2018/19, Aguero is out on his own as the Premier League’s leading scorer from open play. Alongside his big-game scoring habit, Aguero has routinely been City’s most consistent breakthrough provider this season. As proven by numerous statistical studies, scoring the first goal in any Premier League fixture significantly increases a team’s chances of winning the game, and 50% of Aguero’s 14 goals this season have been the opening goal in City’s fixtures. On Sunday afternoon, City will be banking on another critical contest impact from Aguero in their latest Premier League test against Chelsea at the Etihad Stadium. Fresh from 6 goals in his last 5 appearances in league and cup for the Citizens, Aguero seems to be fine tuning his predatory instincts ahead of what promises to be a white-knuckle final third of the season. Against a Chelsea defence that has kept just 1 clean sheet in 7 Premier League away matches, and shipped 6 goals in the last 2 of those fixtures alone, there is every chance that Aguero will perform the role of big-game talisman again for City this weekend. 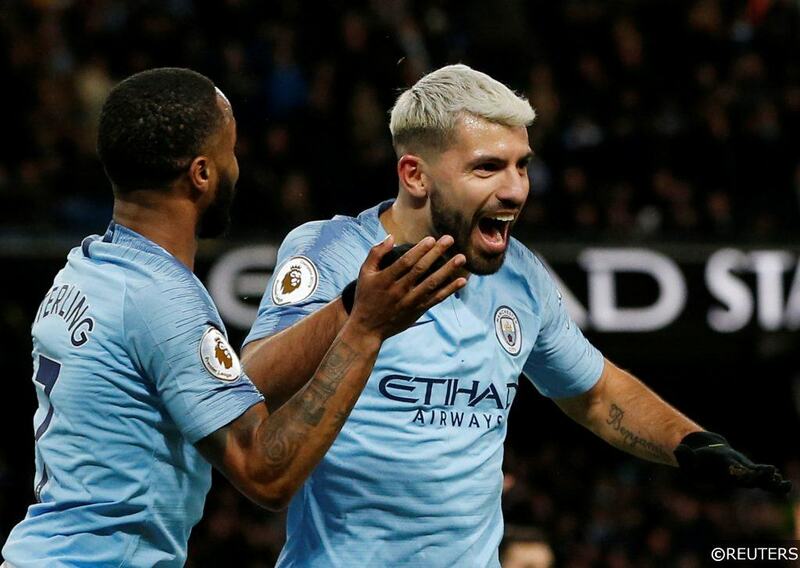 These are the situations and matches that Aguero thrives in – when the chips are down and City’s need is at its greatest, Kun usually provides. Click here to read our detailed Manchester City vs Chelsea match preview, predictions and free betting tips. Categories: Blog, Football, and Premier League. Tags: Chelsea, Man City, Manchester City, Premier League, Sergio Aguero, and Title race. Team Tag: Chelsea and manchester city. League: England Premier League. Sports: Football.